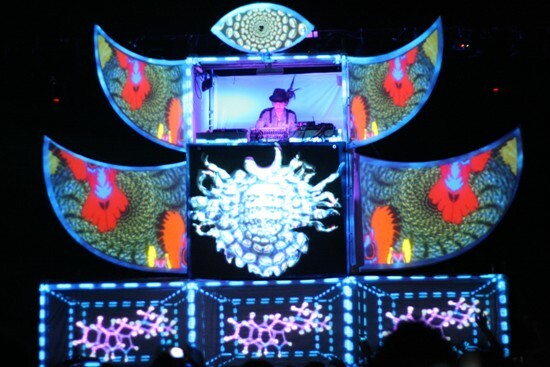 Brooke Kettering has produced a very informative interview with Simon Posford of Shpongle and Younger Brother over at the Roving Festival Writer website. Simon has been busy touring the US this year doing a number of huge festivals with the Shpongletron Experience show. Read on here for some insider Shpongly tid-bits and Simon's opinion of dub-step, genres and DMT. B: How are you doing? S: I’m good, a little tired, but umm feeling good. Excited for tonight’s show. B: Have you been touring like crazy? S: Yea, I’m on an eternal tour. We’ve done, I don’t know, ten days or something like that. We’ve only just started I guess, and it’s fifty shows in total. B: So you’re touring as Shpongle right now, correct? S: The Shpongletron, ya, exactly. B: Right, how was Coachella? S: Coachella was amazing. A lot of people, and fantastic production. So everything just conspired for a great show. B: When you go to festivals like that, do you ever get time to enjoy yourself? S: We did. Um, commercially I suppose Coachella isn’t really my type of festival but um, the only people we really wanted to see were Trentemoller but because all the people and stuff we got stuck by Duran Duran for some reason. B: So you got to hang out for a few days or were you back on the road right away? S: We stayed for two days, we saw Duran Duran and Kanye and a few other people. But pretty much had to go straight out. B: So, I’m more of a conversationalist than a journalist, but, hopefully we can just have a nice conversation and I’ll able get some interesting stuff out of it. S: Ya, I mean ask me anything you like and if you want me to expand further I always can. B: Something that I found interesting…have you heard of CouchSurfing, the website? S: Really? How is it? B: It’s been awesome! I’ve had all great experiences. I hosted this one guy from Israel and, I always try to find a common ground in music, and in saying that I listen to some electronic music, he said he listens to Shpongle. And then I was in this remote part of Mexico (Mahahual), where I became friends with these Mayan dancer dudes, and in talking about electronic music, Shpongle was our common musical ground. You obviously tour all over the place…why do you think Shpongle is soo…can appeal to anyone? Nothing is new in music or so the saying goes. When it comes to modern day psychedelic electronic music such as we find in the psytrance and psybient scene, is it possible to trace their roots ? Quite possibly. I find that the music that is played out on the dance floors of the international trance circuit has elements of music and feeling from the late sixties and early seventies. The music of that time often displayed long repeating bass-lines under floating, shimmering guitars that took the listeners on a journey much as modern day psychedelic electronic music does. I was wondering how many listeners here might enjoy listening to some of the more obscure and hard to get tracks from that era so here I'd like to share with you a great little site called "Sonic Daydream" run my the mysterious Tom D. I've been listening to this site for many years now and I'm glad to see that Tom is back on the air after a bit of a slow period. This site is an absolute gem for music from around 1965-1975 - a golden area for freaked out psychedelic rock and pop. So take a break from the usual and add a bit of spice to your psychedelic listening with some absolute storming tunes from the psychedelic 60s and 70s all expertly mixed by a self proclaimed psychedelic music snob. Brilliant stuff. Psychedelic pictures and images from around the web. Here I'd like to present to you a list of my favorite psychedelic picture resources. Apart from mixing psychill and psybient music, psychedelic art is another passion that consumes a fair chunk of my time. If I'm not drawing it I'm usually reading about it's history, the artists backgrounds and their inspirations for the psychedelic pictures they come up with. To begin with, one of the best psychedelic art repositories you can visit these days is psychedelicart.com. 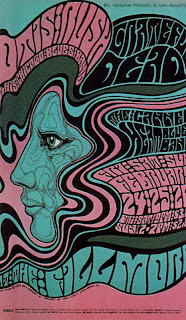 This site is contains a massive collection of old retro psychedelic bill posters from the 60s and 70s. 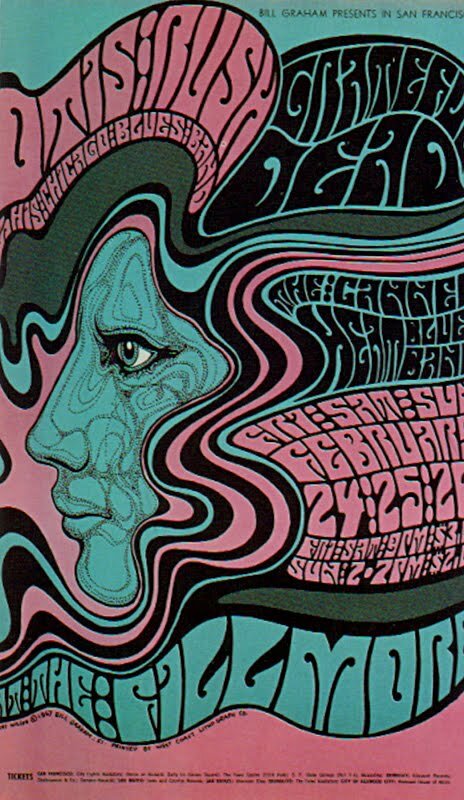 Each of the psychedelic posters can be viewed in detail along with information relating to it such as the artists name, bands promoted, venue and production date. An excellent site for inspiration for you next psychedelic picture. 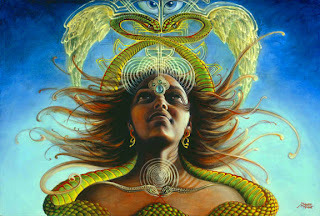 Next you might want to check out the visionary artists vault over at Erowid.com. This is a commercial free site that includes an enormous amount of artwork from psychedelic artists around the world. You can spend hours here browsing through the directories ! Both amateur and professional psychedelic artist works can be found here. For a quick overview select the curator's picks link for a fine selection of free psychedelic pictures. Some eight years ago I signed up at a little website called DeviantArt.Com. I joined the then newly formed psychedelic art forum and started uploading art. It's amazing to look back now and see just how far the site has come. From it's humble beginnings into a fully fledged internet star. DeviantArt has been helping to promote artists of kinds for many years now and psychedelic artists are well represented there ( if you can ignore all the dodgy anime stuff ! ) . What I like about it is the supportive communities that form there where you can swap ideas and drawing/painting techniques and materials. I've have learned so much from the other psychedelic artists there and continue to do so each week. Have a look today - there is a lot of great trippy art to be found in their galleries. Another visionary art archive with a number of psychedelic pictures is the Society for Art of Imagination website. This is a excellent storehouse of imaginative and sacred art that is of the highest quality. Speaking of sacred art, one site that actively encourages its members to share their spiritual creations is Lila.com. This is an excellent portal that can keep you up to date on the latest news in the visionary and psychedelic art worlds. There you can find lots of articles, artist interviews, and extensive online gallery of psychedelic pics and exhibition schedules. Another huge surreal gallery with a good number of psychedelic pictures is the Surreal Art Collective at beinArt.org. This is a very well supported sight with active forums that allow you to get in contact with fellow artists to share ideas. One of the central aims of beinArt.org is to show the work of internationally renowned artists like HR Giger, Ron English, Ernst Fuchs, Robert Williams, Mark Ryden, Lori Earley, Paul Booth, Laurie Lipton, Michael Hussar, Chet Zar, Chris Mars, Liz Mcgrath and Alex Grey with the work of lesser known, though extraordinary artists. Well those are a few of the sights that I can remember off hand. There is plenty of inspiration to be found among their pages so I hope you find something worthwhile there. If you happen to know of any other similar sites with psychedelic pictures or psychedelic images, let me know and I'll add them to the list. Cheers. If you have ever wondered how the likes of Shpongle, Ott or Shulman get those atmospheric gated patterns you hear so often in their tracks then wonder no more. DJ Story from the Intuitive Beats website has produced a very easy to follow video on how to make gated patterns using sidechaining in Ableton music production studio.